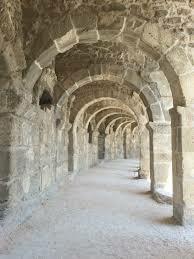 Aspendos is a word coming from old Anatolian languages. Aspendos Ancient City is at the 39th km of Alanya highway in Antalya, within the boundaries of today’s Belkıs Village after 7 km after reaching the Serik town, near the Köprüçay (Euriymedon) river. 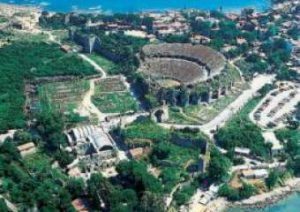 In the 10th century BC; Aspendos which is built on top of two hills, one big and one small, to enter by Achaeans and Pamphylian city, is one of the richest cities of ancient times. 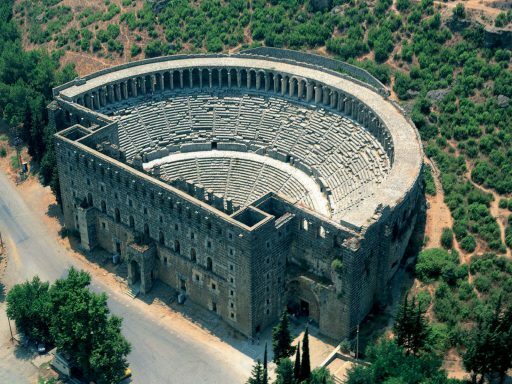 The Aspendos Theater was founded by the Romans in the 2nd century AD and is the best-preserved theater of the Mediterranean. Mimo is Zenon, the son of Theodoros from Aspendos. 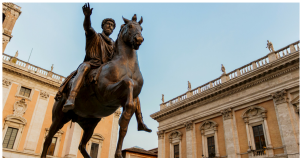 The ancient theater which is started in the time of Antonius Piu was completed in the time of Marcus Aurelius (138 – 164 AD). 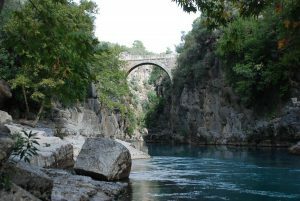 Antalya Köprüçay (Euriymedon River) is one of the most active rivers of the region where the rafting tourism is still on today. Despite the fact that is the pirate town of Side, Aspendos is a farm art, an art center. Mutual Competition Owners from Aspendos are known with ‘Do not be rude like those from Side’ expression and those from Side are known with ‘Do not be weak like those from Aspendos’. 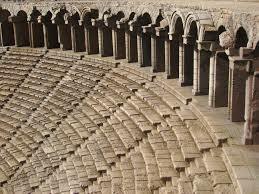 At the beginning of the works that made the ancient city to become an art center, it comes the theater. 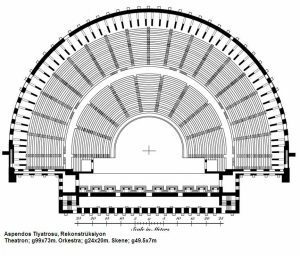 There are myths told about the theater. 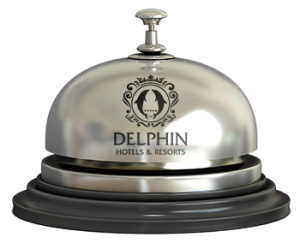 In accordance with a myth: The King of Aspendos has a daughter named Belkıs, famous with her beauty and with numerous desires. The King has a contest to choose the person to give his daughter among the people who want to marry his daughter. He will give his daughter to the one who will create the most beautiful and most useful work for the city. 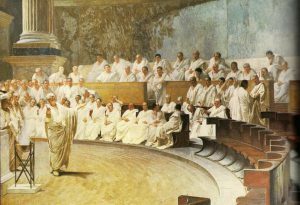 But as a result of the competition, there were two works, one of them was aqueducts coming far from the city, passing through many difficulties and taking water to the city and the other one was the best theater which is known as the acoustically best theater of the world where the voices are heard even from the top lines when metal coins are thrown. The King seeing that both works are unique, divides his daughter into two parts to avoid from injustice. The half female figure in the theater is explained in accordance with this story. There is a fairy tale told by the villagers at Belkıs Village near Aspendos and it is as follows: ‘The Sultan of the Snakes falls in love with the Queen of Bees. When the queen rejects him, he builds a bridge from Toros to the city and kidnaps the Queen of Bees and bring her to the city and marries her. The Queen of Bess dies right after giving birth to the girl named Belkıs. The Sultan of the Snakes makes a sanction for his daughter Belkıs.’ The bridge, aqueducts: the palace mentioned in the fairy tale reaches the present day as Belkıs Theater. 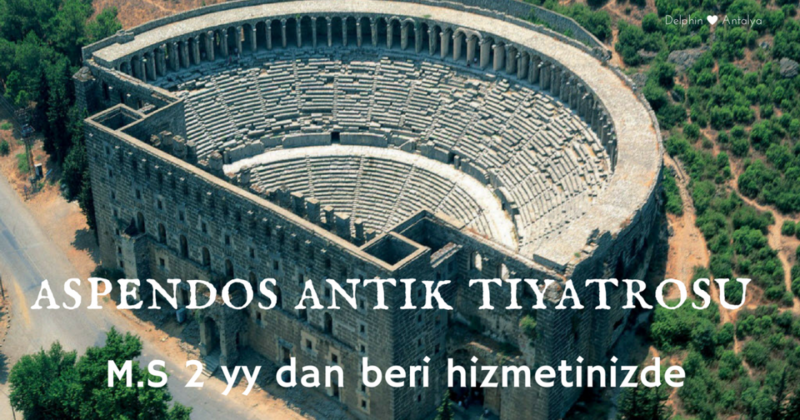 The Aspendos Ancient City and the theater are also called ‘Belkıs’. 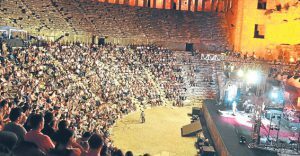 The Aspendos Theater which hosted 20 thousand people during the period of its construction, is also hosted thousands of visitors every year as well as a number of national and international concerts.